Liberty Seated coinage, particularly in the early years of the design, has a large number of misplaced dates. In fact, there are so many, and in so many different places – denticles, rock, gown, shield – that one almost has to wonder what was going on. Those of us who study die varieties might not even be surprised to find a date on Miss Liberty’s face or in the obverse fields. While confessing great ignorance as to just how the date punch was positioned in order to add the date to the working die, I also have to admit that I have wondered if some of the mint employees of the time were blind, drunk, or both. How many times did they miss the die entirely? Was there a bench somewhere at the mint with dates of various sizes punched into its surface? Perhaps employees, in scenes reminiscent of the The Three Stooges, had dates accidently punched into various body parts? It’s easy to be critical from a distance of 170 years and I am certain that positioning the date on the dies was far more difficult than we imagine based on our personal experiences in 2012. And, that difficulty gives us much interesting numismatic material to study. One of the most interesting, and arguably the most extreme misplaced dates in the Liberty Seated Quarter series is the 1850 quarter with the base of a one on the rim. It appears the punch did, in fact, very nearly miss the die entirely as the date was being applied. One notable feature of the 1850 “1 on rim” quarter, is that it is difficult or impossible to attribute in low grades. 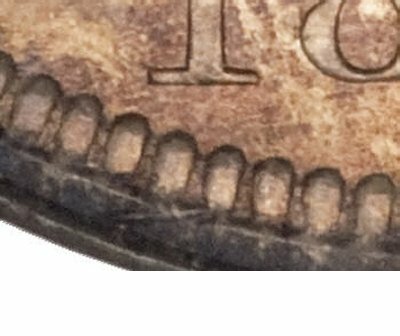 The rim, being the highest point of the design, wears away first, tending to obliterate the “1” on most coins grading below XF. The 2007 LSCC survey indicated that 1850 quarters without the extra digit outnumbered those with by a count of 26 to 17. As expected, only 2 coins with the extra 1 were reported in grades from AG – VF, whereas there were 17 coins in that grade range without the 1. The grades XF and above, in contrast, featured 15 coins with the extra digit, and only 9 (including two proofs) without. Though partly speculation, I tend to believe that somewhat more than half of 1850 quarters are the variety with the extra 1; but the two obverse dies that have been identified are too similar to prove that with coins grading below around VF 30 by today’s standards. 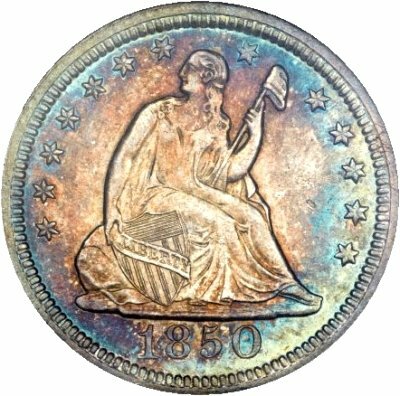 The 1850, as a date, is scarce and pretty well known by collectors as a better date in the series. Its rarity increases with grade to the point that it was considered to be R7 (4-12 known) in mint state by Briggs in 1991. Though the past twenty years have seen additional examples come to market and, arguably, a loosening in the definition of mint state, the issue remains about R6- in mint state (estimated 25-30 examples). Amongst mint state Philadelphia quarters certified at PCGS the 1850 ranks fourth (behind the 1848, 1869, and 1842) with 14 “grading events” for mint state coins.